Mud sales are heavily supported by the local Amish population, who “easily made up more than half the crowd” at Saturday’s Bart Fire Company Sale. Which shouldn’t be a surprise, since a significant number of Amish serve on the fire companies themselves. I recently learned the 14-year-old son of a friend has ambitions to do so. This is apparently the age when you can start your training, which he has done with no lack of youthful gusto. Mr. Fisher, 62, with a long gray beard, has been a fire company volunteer for several decades. He said the fire volunteers, Amish or English, get along well and talk freely among each other. This past Saturday was a big day for mud sales, with four happening that day alone. The next on the slate will be this Saturday (March 23rd) on behalf of the Gap Fire Company. Up for sale that day: Sporting goods, windows & doors, new & used furniture, quilts, crafts, dry goods, groceries and more. For more info, here’s a 2013 mud sale schedule. A few years ago, reader Rick contributed some photos and stories from mud sales at Rawlinsville and the Bart/Georgetown area. Ever been to a mud sale? I have never been to a mud sale but I would really like to go. Wonder if they have them in New York State. A little mud wouldn’t stop me. No worries Margaret, and if you go to the in-post link there is a listing of what is being sold at each sale. The mid west Amish just don’t come close. Can’t wait until the summer when I can visit the Lancaster settlement again. We went to the Bart sale last year, and the Gordonville sale last weekend. So much fun. We didn’t end up bidding on anything, although if we had gotten there earlier, we would have liked to bid on several things in the garden equipment section. We saw so many great deals. We also bought some delicious scrapple, and brought home apples, grapefruit, and a handful of books from the Gordonville Bookstore. Thanks for the link, Linda! I loved the picture of the young boy nearly sunk in the mud! Erin, that’s exactly the picture I remember the most! I grew up going to the Rawlinsville sale. I miss these kinds of activities so much. I think I have a small tear in my eye right now. :'( There is just nothing like lancaster pa. I can almost tastet the chicken corn soup and whoopie pies. Nope, I’ve never been to one, and something tells me I’d need to purchase a REALLY good pair of “slop” boots if I were to attend! I’m a little more familiar with the type worthy cause mentioned here (volunteer fire dept. ), as I have a female cousin way up north in Wisconsin (Webster area) who still volunteers (in her mid-60’s) with her community’s volunteer fire dept. I truly admire everyone (including that 14-year-old boy) who volunteers to fight fires. I’m sending up a prayer for all firefighters, everywhere, as I type this…God bless them and keep them safe as they protect our communities. The bit about the shoe in the mud made me wonder whether the person a) couldn’t get it out, b) lost it in the muck, or c) just abandoned ship. I have been to a mud sale. It was really fun and the crowd was great. The one that I went to they were showing horses so as you can imagine there were quite a few Amish people there to look and alot of the younger Amish boys were doing the showing of the horses. It was fun to watch them run the horse sown this long road turn around and run back. My youngest son enjoyed that alot. The Amish people that were there were very friendly and some were pretty talkative. I did not bid on anything but there was about everything you could imagine for sale. I live in Md. about an hour and a half at most from Lancaster so I plan on going to at least 1 or 2 this year. We are doing some work around our house and the mud sales could be a really good place to pick up tools and supplies. Now that you posted this Eric I will have to go over the schedule and pick the ones I would like to go to based on the items being sold. Have you ever been to a mud sale Eric? I would think that you have. You know Tom I’ve been to a fair share of Amish sales, and I’ve gotten mud (and other things) on my feet, but I don’t think I’ve been to an official bona fide mud sale, unless it was very briefly. I’m usually in Lancaster County right before (earlier in Feb), or sometime after they are going on. Of couyrse I met down the road not sown the road. Also, I didnt mean to say that I would think that you have. I was trying to say I think if you had you would really enjoy it. I’m new to this posting thing so I have to learn to read my comments before I hit post and slow down on the typing. No worries Tom, that was a safe assumption. And your meaning was clear. I’m glad you took the time to share here. I have only heard of Mud Sales on this website (and in Amish fiction books). Are Mud Sales ever held in the Midwest? I have been able to find auction flyers for Amish school fundraisers, but I have never attended one. Would certainly be fun! I wish I could say there are Mud Sales in MN, but we’re in a blizzard right now with 4 inches of fresh snow and wind chills reaching 40-50 miles per hour causing blowing and drifting snow and white out conditions. Many schools across the state are closed today. Wishing Spring would arrive! I must admit I’d never heard of a “mud sale.” Around here volunteer fire departments are much more likely to be supported by a “fish fry.” Fish Fry’s are kind of a staple in the Ohio countryside. Many small villages, churches, etc. will sponsor them to raise funds. They are really fun to attend and a good way to eat some really good fish as well. If you’re interested I have some great shots of the Gordonville sale that I’ll gladly share with you. Where would I send them for you to view? I just sent you a bunch of pictures. Enjoy!! There are about eight of us that have gone for the past twelve years or so. We make a weekend out of it, going to the local farm markets on Friday, staying at a local inn, going to the sale on Saturday and returning home on Sunday. We’ve trudged through the sales grounds in snow, rain, and wonderfully clear weather and always have a wodnerful time of it. You just missed our local mud sale – it was on Saturday at the Airville Fire Company in southern York County, just across the river from Lancaster County. I took my 7 yr old granddaughter and we had a blast. She especially loved the livestock area with guineas, chickens, rabbits, guinea pigs, goats and baby peeps. Last year I got a quilt, so this year I scouted around for something else. I ended up with a beautiful Longaberger basket for a great price, then found out later it had belonged to my cousin’s wife who died suddenly a couple months ago. Now I can enjoy my basket and warm memories of Paulette at the same time. As for the mud, it wasn’t bad this year, but we still managed to drag some in the house on our shoes and our car tires were coated. My granddaughter suggested we scoop it up and take it back to the mud sale so they could sell it, just like the name says. At least 1/4-1/3 of the people there were Amish and we got to talk to a few of them – fun day for everyone! I thought that picture looked familiar! Now if I could only justify braving the elements to get back there in the winter! I’m afraid I’ve turned into a fair weather auction-goer. I’ll have to rate the sale items to be better at the mud sales, but the Clinic for Special Children auction is tops for “purpose” in my book. I wnder if there are any Mud Sales in New York near Penn Yan, Waterloo, Clyde-in my area. I would love to go to one. 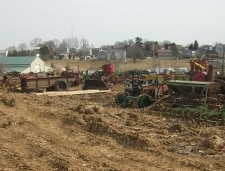 I have been to the Mud Sale in Strasburg, PA several years ago. Can someone compare or contrast between some of the others? I am interested in quilts and my husband likes all kinds of things. We would like to go again but maybe try a different one – any thoughs? We live in the Western part of PA so we would stay overnignt and then go to the sale.